Pity the Minnesota Wild fans who bought tickets to Game 3. I can imagine it now: the frustration of the weekend’s 4-1 loss at Game 2 in Chicago; the tiny glimmer of optimism as fans convinced themselves of the potential of a Tuesday-night win; the endless early workweek anticipation, everyone feigning smiles throughout two grueling days of “May the Fourth be with you” and Cinco de Mayo elevator jokes. Surely it would all be worth the distraction and expense; surely the Wild, a 100-point regular-season team that had pretty handily knocked off the St. Louis Blues in Round 1, would get this game and cut the Blackhawks’ 2-0 series lead in half. Surely, at the very least, the fans would get to be inside a loud and proud building for a fun and festive hockey game. Instead, the Wild faithful were force-fed the most unpalatable of outcomes: a slow-drip 1-0 loss, a game that edged the team right up against postseason elimination. Not once did the crowd get to so much as sample the sweet satisfaction of going batshit bonkers for a goal. Instead they groaned as several second-period chances passed them by: a fruitless breakaway by Mikael Granlund, a save on Nino Niederreiter, Jason Pominville missing the net completely. As the third period ticked slowly down, they wished they had hockey sticks so they could slam them against the ice or boards in anger. (That’s how the players were coping, anyway.) Everyone unaffiliated with the Blackhawks, from Zach Parise to all the poor souls in the background of this photo, left the arena full of disappointment and existential dread. It was enough to convince a person to just stay home next time around. 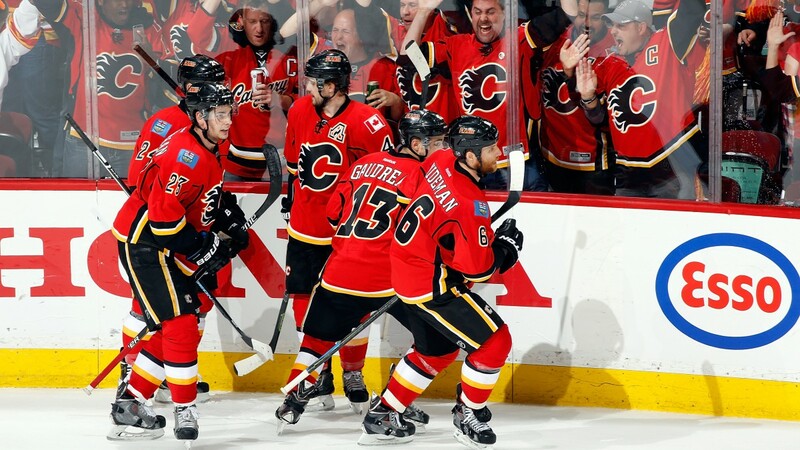 But envy the Calgary Flames fans who bought tickets to Game 3! After a 6-1 shellacking in Game 1 at the hands (at the webbed feet?) of the Anaheim Ducks, and a 3-0 shutout in Game 2, the narrative around this matchup was that Anaheim could likely win a second straight series against a Canadian franchise in a clean, no-nonsense sweep. All season long, the Flames had been confounding analysts and onlookers with their inexplicable ability to keep racking up points — to come back from major deficits, to pull things out, to win when all the signs were flashing LOSS in blinking neon script. It finally seemed like the party might be over, that mom and dad had come back early from vacation and were striding up the front walk toward the house. But Brandon Bollig scored two minutes into the game to give Calgary a 1-0 lead and give the Saddledome fans, dressed uniformly in red jerseys (well, mostly), a bit of value for those pricey tickets. The Ducks rallied back to lead 2-1 by the end of the first period, putting the cosmos briefly back in order, and the two teams traded goals in the second. Midway through the third, the Ducks were up 3-2 and appeared to be on their way to a commanding Chicago-like 3-0 series lead. Late in the game, a slew of penalties (some procedural, some fishy, some legit) gave Calgary a man advantage in the closing minute. The Flames pulled their goalie so they could skate 5-on-3. Johnny Gaudreau, a 5-foot-9 forward who is one of three finalists for rookie of the year, got the puck and skated into the zone. For a moment, as he reached the hashmarks, he briefly contemplated a pass. Then he took a few more strides and unleashed a Kane-like shot instead, with 20 seconds left to play. Goal; pandemonium; hugs and kisses; fists aloft; tie game. Four minutes and change into overtime, as more controversial calls and non-calls once again piled up, Mikael Backlund — who led all Flames forwards in ice time in the game — took a shot from the high slot that wound up in the Anaheim net for the 4-3 win and a glimmer of hope going forward in the series. There’s a lot to focus on when you watch the replays: Jiri Hudler’s screen; Gaudreau failing to quite penetrate the celebratory group embrace, like a puppy being squeezed out during a feeding frenzy; Ryan Getzlaf bickering with officials; the rapidly clearing Calgary bench. But what stands out most is the bright red backdrop, the fans who all unwittingly react the exact same way, like one giant, teeming organism. They raise their arms and jump up and down like little children — really, what else is there to do? It’s impossible to know what you’re gonna get when you buy a ticket to a Game 3, but for them, on this night, the getting was good.